On czechbeadsexclusive.com you will find lots of craft supplies for many popular crafting techniques. Are you looking for inspiration? 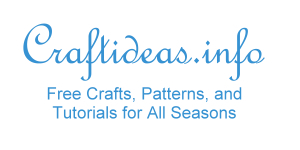 Here you will find lots of tutorials and patterns to keep you happy and busy all year long! Octaneseating.com offers a comprehensive guide for people wanting to get into woodworking. The Guide to Choose the Best Type of Wood for Your Furniture covers a wide range of subjects including types of wood, wood quality, processing, and useful tools. If you are looking for a natural alternative to store bought candles, then you can learn How to Make Soy Candles. An illustrated step-by-step tutorial from 1502 Candle Co. shows you everything you need to know about choosing the wax and fragrance to melting the wax and filling the containers. Once you have learned how to make these, you will probably want to make more. These candles would make lovely gifts for everyone on your list, too. and tags. They can come in handy for decorating homemade Christmas cupcakes, tagging gift packages, creating Christmas crafts and more. For example, see how easy and fun it is to create a Christmas label. 1. Fully free without providing any personal details including email address. 2. Lots of ready-made elements to design custom Christmas stickers (shapes, borders, backgrounds, graphics, fonts and colors) + upload your own photos / images. 3. No design skills or experience needed. With this lovely set consisting of an oil cloth Makeup Bag and Makeup Brush Roll, you can travel in style and keep your cosmetics organized at the same time. Lea Griffith has an illustrated tutorial on her website for both projects, so once you have the supplies you need, you can get started. This Upcycling Your Rug Infographic from The Rug Seller shows some really great ideas what all you can create using a rug. The image above is only a portion of the complete infographic. Please click on the image to see the page in its entirety. This Easy Scrap Fabric Yo Yo Can Upcycle Tutorial is a great idea from Borei Design and shows you how to upcycle a can into cute, decorative storage using scrap fabric and paper. If you are planning a Halloween party with the kids, it is always great to have games to play with them. These Free Printable Halloween Bingo Cards from The Kiwi in the Clouds are perfect for hours of fun. Now that it is fall, a pumpkin project is needed and this one from Ameroonie Designs is an excellent choice! These Bead Board Pumpkins are easy to saw out and the molding lines down them give them such a perfect look. The weathering adds a nice finishing touch to them. She has an easy to understand tutorial to follow which guarantees success if you choose to make this project. The blog Craft and Creativity is jam packed with fantastic and colorful ideas to keep you busy for hours. One of the great projects to be found are these tea light holders which are covered with recycled book pages. What a unique and stylish idea! These particular examples use encyclopedia pages of old medieval villages and the cut out windows are a great extra to let some light shine through. There are more examples of Recycled Books Tea Light Holders on the blog. She has many lovely ideas using several books in both color and black and white. If you have ever been afraid or intimitated to refurbish wooden furniture because you were not sure how to go about it, this well illustrated Furniture Facelift Infographic from Fix.com shows you everything you need to know to get started, what tools and supplies you need and all other information to help you through the process. This image shows only a portion of the complete chart. Aren’t these gorgeous? When I see the cheerful colors she used, I think of a relaxing summer evening on the patio and these being the light source. All you need to make these Catherineholm inspired DIY Candleholders are paper and glass plain candleholders. It is just that easy and the tutorial to make these as well as template you can print out can be found on How About Orange.